Allié often uses her work to questions the place of the body. She frequently uses childhood memories, experiences from daily life and current news to create her installations. These ‘objects’ are traces that bear witness to many of her own existence and that of others and they also reveal the course of time passing. Fanny has installed a project titled “Silhouettes” at Gallery Aferro located in Newark, NJ. 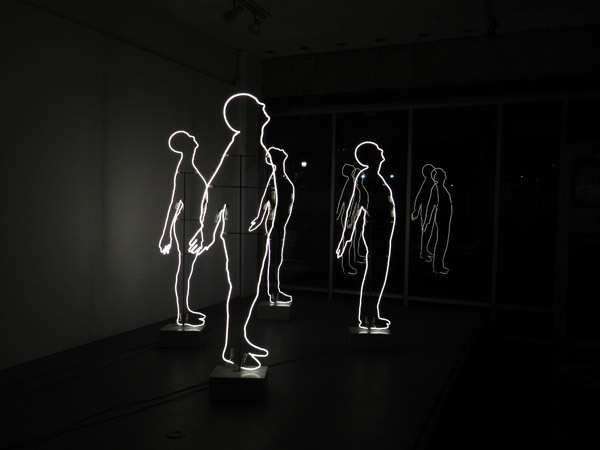 The piece features four neon light and metal structures, height ranging from 5.4ft to 6ft. Fanny Allié’s art will be featured in the Activate: Market Street project among many others. Activate: Market Street is a “Must see project”! The activation will begin on June 15th 2013 located. Launch locations: 73 Market Street, 75 Market Street, 77 Market Street, 85 Market Street, 93 Market Street.